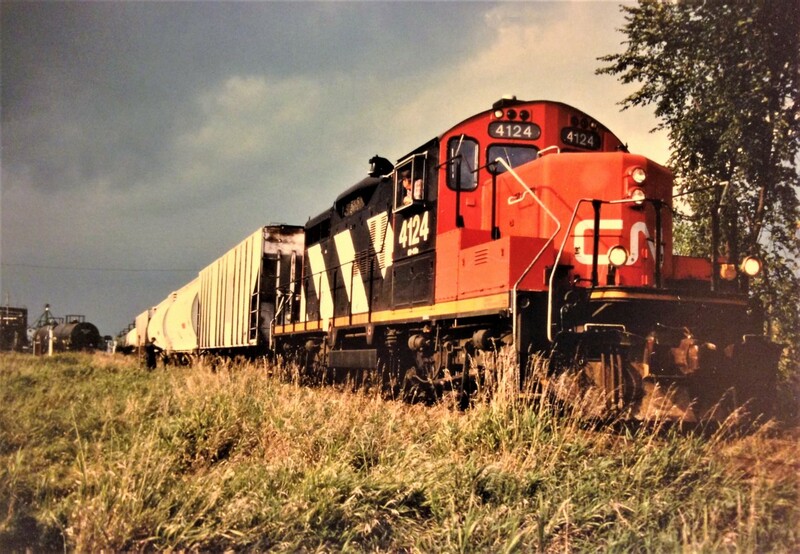 Railpictures.ca - Jason Noe Photo: Engineer Dennis Fleet looks back at his train as the crew of the 15:30 Kitchener Job attempts to work ahead and depart Elmira, Ontario on September 11, 1996. The crew is finishing switching at Sulco Chemicals before an approaching super cell descends on the area. CN GP9RM 4124 would soon throttle-up and haul its sizeable train back to Kitchener along the Waterloo Spur eventually being overtaken by the fast moving storm. | Railpictures.ca – Canadian Railway Photography – photographie ferroviaire Canadienne. Caption: Engineer Dennis Fleet looks back at his train as the crew of the 15:30 Kitchener Job attempts to work ahead and depart Elmira, Ontario on September 11, 1996. The crew is finishing switching at Sulco Chemicals before an approaching super cell descends on the area. CN GP9RM 4124 would soon throttle-up and haul its sizeable train back to Kitchener along the Waterloo Spur eventually being overtaken by the fast moving storm. Thanks for the comments Graydon and Larry. Nice touch with the class lights on. Love this Jay!! This totally made my day! Thx for posting and great shot also!